I always suspect everyone sees the new year as a new beginning. A pathway into something fresh and clean, that can be transformed into any type of sucess we wish it to be. For some reason, the new year this year seemed to bring a sort of peace to my heart and soul. Perhaps the baby growing in my stomach has me crazy anxious and really hopeful for 2012? Maybe that has a little something to do with it. So, today's photo isn't the best of quality (because of taking it on a film camera in 2001 and subsequently scanning it and copying it and resizing it over the years) but it is just peaceful. It was taken on a whirlwind girl's trip through Europe at Vimy Ridge in France. It was en route back to the dreaded ferry across the English Channel back to Dover, England. 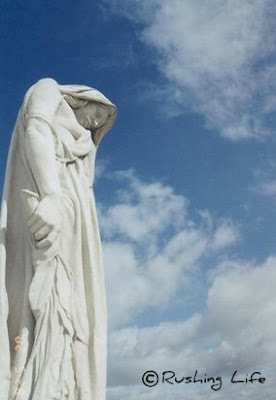 It's a Canadian War Memorial dedicated to soldiers who died in WWI. It seemed like a bit of a random stop, but it was a gorgeous day and it was a somber moment after all the chaos and lights and scandal of the big cities we had just passed through over the previous 2 weeks. It was a fitting end and a calming, peaceful, moment to cherish with good friends, both new and old, as we wrapped up our tour. Here's hoping everyone can find their peace in the new year... no matter the size or shape it presents itself in.